Cheapest price is $11.35 from GamersOutlet. 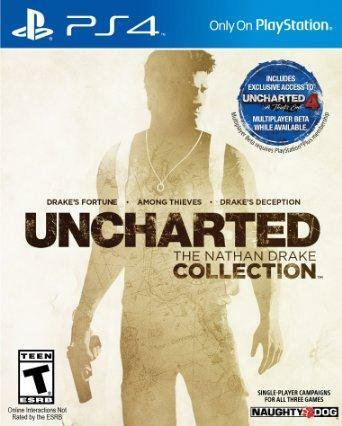 Best Prices for Uncharted: The Nathan Drake Collection Ps4 found from 3 stores. Uncharted: The Nathan Drake Collection Ps4 prices has been viewed a total of 2,363 times. PLEASE NOTE: A U.S. PSN account is required to activate this game. From the groundbreaking storytellers at Naughty Dog, comes the genre-defining epic that revolutionized adventure storytelling, rebuilt by Bluepoint Games with the power of the PS4 system. Experience one of the most revered game series of all time as you follow the perilous journey of Nathan Drake across the globe, from humble beginnings to extraordinary discoveries.